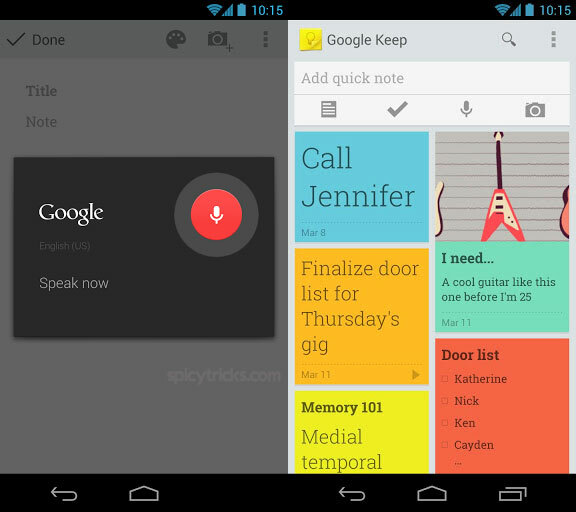 Google Keep is the Newest Android App developed by Google to Take notes. This New Note-taking app is currently live and available in the Google Play store. You can download and use this app only in the Android devices that come With Ice Cream sandwich and above. Using Google keep you can make a list of notes and you can prioritize them easily by dragging them. In addition, You can use the color codes to highlight your notes and add the same colors to similar tasks to easily figure out that. All of your notes will be saved in your Google Drive, synced with all your devices so you can access it from wherever you are. Google keep also allows you to add images to your lists.